Moviegoers are about to take a journey along The Road. It’s a harrowing experience. Cormac McCarthy’s novel is a post-apocalyptic survival story about a father and son struggling to maintain hope after the collapse of civilization. The movie is not as powerful, but then, how could it be? It’s a two-hour visual paraphrase of McCarthy’s poetic prose. Nevertheless John Hillcoat’s adaptation forces us to face the fragility of this beautiful world. It reminds us to cherish the grace we now enjoy, and to realize the importance of any opportunity for tenderness. And it affirms that the act of raising children with love in this troubled world is ultimately an act of hope and an investment in a brighter future. Horrifying visions like McCarthy’s are unpleasant, to be sure, but they’re also useful as cautionary tales, necessary nightmares. But moviegoers should note that this holiday season also brings something better and brighter — a movie that can deepen our appreciation of everyday grace through its beauty, poetry, humor, and love. 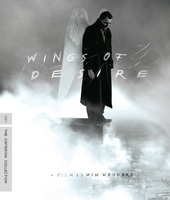 That film is director Wim Wenders’ 1987 feature Wings of Desire, which won the Palme d’Or at the Cannes Film Festival. Film lovers can now enjoy it in a glorious new DVD and Blu-ray edition by the Criterion Collection, featuring a feast of bonus materials. The movie will not thrill everyone who sees it. Some will tell you that Wings of Desire makes 127 minutes feel like 127 hours. But such testimonies may tell you more about the moviegoer than the movie itself. No, this isn’t a “snack” of a movie that you can tear open and wolf down. It’s a feast, provided in several courses, each one rich with sensual experiences and questions to “chew on.” Do you have the patience to appreciate its beauty? Filmed by cinematographer Henri Alekan, and featuring a screenplay co-written by the German poet and playwright Peter Handke, Wings of Desire stars Bruno Ganz and Otto Sander as angels. Yes, angels — observers who descend from heaven to consider the struggles of humankind and to witness the glory of God as it is revealed right in front of us. Ganz plays Damiel, an angel who is particularly fascinated by human experience. He wants to know what we know — the taste of coffee, the touch of human tenderness, the buzz of a cigarette, the difficulty of not knowing, the possibility of wonder. The film follows him as he decides to become human and experience these things for the first time. Along the way, he’ll get to know Peter Falk — yes, Falk plays himself, and Columbo jokes come up with some frequency. Why Falk? That’s one of the film’s whimsical surprises. Falk seems an ideal human being when it comes to appreciating the particularity of experience; he’s a wonderful mentor for Damiel. Of course, the journey involves a woman as well. Solveig Dommartin plays a trapeze artist who longs to know the joy of flight, and whose poetic sensibilities are particularly appealing to angels. It’s a thrilling experience if you allow yourself to be drawn into the angels’ frame of mind. It’s not just about living life. It’s about loving life. Such was the case when he filmed Wings of Desire. Wenders, who had wandered away from his Catholic upbringing, found that filming from the perspective of imaginary angels caused him to discover, and capture on film, wondrous things he had never planned. It was part of his journey back to faith. Editor's Note: In Part Two, SPU Associate Professor of Christian Ministry Jeff Keuss and filmmaker Scott Derrickson explain why they love Wings of Desire.